One of the main approaches I take to the market is trading Price Action. My approach is a little unique and therefore it would be useful to explain the fundamental principles underlying my theory of price action. Before I begin discussing various price action strategies, and tools for reading / trading price action, I must begin with a working definition of ‘what is price action’. From this broad definition of price action, I will then talk about how it relates to order flow & the relationship between price action and order flow. A broad definition of price action would be ‘Price’s movement over time’. This is vague by itself, so I will expand this with ‘on any timeframe’. This means on a tick chart, if the price of the AUD/$ moves from 1.1000 to 1.1001, this one pip adjustment in price is an example of price action. So in its rawest form, price action = price’s movements over time on any time frame. These various price fluctuations will look different based on what time frame being used when looking at price action on any instrument. Order flow is a general term which refers to the transactions (buying or selling) that cause the price of an instrument to fluctuate. Any transaction, whether it be a market order, a buy limit order, buy stop order, etc., is an order or transaction. Order flow is the most proximate driver of price changes and price action in the market. It does not matter if a participant bought or sold the EUR/USD because of a fundamental event or technical event. Because of this - price action is really the offspring of order flow. But ultimately, when there is a balance between the buyers & sellers in terms of orders, the market will have no directional bias. This creates a range-bound environment for price action. When there is an imbalance in the order flow between the buyers & sellers, this will create a directional bias in the price action, & it is this balance or imbalance we should be learning to read in the price action because it will communicate to us the directional bias, along with where the institutional players are likely getting in and out of the market. Thus, [B]trading price action[/B] [I][B]is not[/B][/I] about trading simple patterns, like [B]pin bars[/B], [B]inside bars[/B], & just responding to the pattern. That leaves you totally un-empowered because there will be times when trading pin bars are optimal, and where they will fail miserably. Your success as a trader to use price action patterns successfully will be in your ability to read the price action & understand what it is communicating. Thus, it is critical to learn how to read the price action & order flow behind it. Remember Rule #1 - this thread is focused on my unique approach to price action and I do not want to confuse or muddle the methods in here with methods espoused by others. This thread is to focus solely on my methods and approach to trade and understand price action. If you are going to talk about a trade you took, please post the actual chart from your broker platform showing the entry and exit at a minimum. This thread has a purpose which is to focus on sharing my methods/perspectives on how I trade price action. If you want to post anything that is negative, argue, berate, or post anything which isn’t neutral/positive, and in the nature of what this thread focuses on, then please do not spam or post on the thread. I understand you may disagree with what I am saying which is fine and I support you to have your differing opinions. But if you feel the need to offer negative feedback, then you are welcome to message me privately and share what you like. This is so you do not to spam the thread or take away from it when it’s intention is to help people understand my method of price action, hence not distracting them with arguments. Anyway, looking forward to your posts and l’m sure we will all benefit from them whatever type of trading we do. ps Have now joined this site as opposed to being a casual visitor…its a great resource too. Well said on the learning path, not being quite linear, but more of a spiral in relating to how we can always approach the same things from a new perspective. I often do this not just with trading, but with great books and movies as well. Sometimes seeing it a 2nd or 3rd time helps you see new things you didn’t before because now you are seeing it with new eyes. This is why constant study and practice is essential - overall well said. Thanks for the kind words. You’ve been a great member of the Price Action Course and I enjoy working with you, but you’ll definitely see more of me here. I have read this Understanding Price Action post and find it quite fascinating, easy to read and informative. I also find the price action terminologies used in this article easily comprehensible. I’m great follower of your posts and other trader educating programs on your sites. Comparing this to your other posts, I find it elaborating the same Price Action concepts in a slightly simpler approach which enhances more understanding. This concurs with my understanding that to comprehend any concept requires relevant, effective and informative resources such as this one. I am very interested and eagerly waiting for more of your posts to come. Just to suggest; if possible include relevant figures/charts to induce clear information and boost price action learning. We get an awful lot of savior trading “guru” types floating through here. They usually having something for sale, but of course that doesn’t come out until later. Usually they wind up not being able to deliver. You happen to be a person I’ve heard of. For that reason, I’ll reserve my opinion. Keep it free, and keep it informative, and you’ll have no trouble. However, mention where someone can go to learn more, but there’s a price for the privilege, and there’s likely to be some rumblings from those here that do give freely. Not to mention BP itself, who frown on their forums being infiltrated by shills. And rightfully so. I am sharing it for free, and will be happy to continue to sharing for free as I build up my basic theory of price action, which is necessary to understand the next part I will be discussing soon. If people want to go beyond and check out my site - that is up to them. If not, no worries at all. If this thread is informative, then it has achieved its goal. In regards to my fund, I have a 9+yr audited track record for my fund so I’m pretty sure that qualifies it and me. But the idea that someone who trades professionally - never teaches is silly. How many professional sports players teach - sometimes for free, sometimes they do camps (and get paid for it). LeBron James, Michael Jordan, I could name plenty. Would you say the same to them that they are wasting their time? Taking time out to teach makes me a better trader so there are definitely some personal reasons behind. But personally, I don’t want to push buttons 10hrs a day just to make money. I don’t want to reduce my life to just being a human ATM machine. That is why I manage a team, along with being involved in philanthropy, along with teaching, along with many things. I personally feel my creative energy does better when I’m doing multiple things, not just one thing. But that is just me. My team isn’t (currently) taking on any new traders as we have enough for now. We trade algorithmically and have enough operators and traders. We only add new when we need to scale up. Until then, i’m only working with new algo programmers. So hopefully that explains where I am coming from and am happy to elucidate further. I don’t think I’m some sort of savior. I believe I have a perspective on trading, along with over a decade of experience (institutional, broker, retail, educational). If people like my perspective - great. If not - no worries at all. I wasn’t planning on charging for my time here and was only planning on writing free content. Again, if people like it great - if not, I hope they find something useful to them somewhere. But I’m no shill, and I’m pretty sure I can deliver. I’ve posted live track records of my students on my site (over a year’s worth of trading making over 110% return). I also post trade setups my students have taken here, on my site and on my fb page so people can see what kinds of trades and style I teach. Hopefully that will separate me from others. But I appreciate you sharing how not to offend people here at BP as I have no intention of doing so and want to participate harmoniously. I’ve recently come across your site and videos. I’m working myself through them all. Nice to see you here and I’m sure many can learn from you. So what is your basic protocol you follow and which signals you find the most profitable? Thanks for the welcome here. In terms of basic protocol (which ill be teasing out further), from a price action perspective, the first thing I’m looking to determine who’s in control via impulsive/corrective moves, then identify if there is any structural changes in the trend. If signs point to continuation, i’ll look for pullback levels to get back into the market, while trying to see if there are any transitions in the price action in the trend. I also look for weakness heading into certain levels, to either take a counter trend pullback, or with trend continuation play, all while working to glean the order flow behind the price action. But this is the basic outline of how I approach it. I’ll definitely be getting into more details of what I said above in the next post for sure. Then building upon that up towards identifying key levels, then using rule-based systems to identify setups. Hopefully this gives a framework to my approach. But I’m no shill, and I’m pretty sure I can deliver. I’ve posted live track records of my students on my site (over a year’s worth of trading making over 110% return). 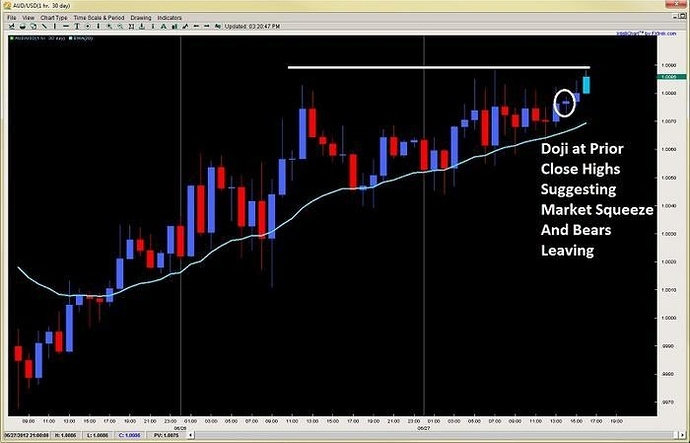 I also post trade setups my students have taken on my fb page so people can see what kinds of trades and style I teach. On top of it, I’m actually getting my personal trading accounts audited and shared at the end of each calendar year - then posting the audit on my site so people can see I’m a real trader. Hopefully that will separate me from others. BP is always friendly to those with something genuine to offer, so I’m sure you’ll fit in just fine. At first look, it seems like it’s full of noobs to the industry, but don’t judge a book by it’s cover in this case. There are some names in the business that contribute to this place almost daily. It would be nice to add yours. You being a senior member and experienced lad in trading - seems like your opinion definitely counts. Thanks for the 411 on BP - I definitely want to acclimate while offering value so hopefully I can. Id definitely like to contribute daily with what i’m lookin at, just not sure how to start a blog. But perhaps I can post them here. Either way - hopefully I’ll contribute to help others become better traders. After bouncing and continuing higher from the pin bar we mentioned yesterday, the 1hr chart on the Aussie looks like the bulls are squeezing out the bears trying to take out the short term resistance at 1.0089. Although the bounce off the oversoldlows the other day has the presence of being more corrective than impulsive, the short term picture although timid favors more upside. We just climbed for 3hrs in a row and the 20ema continues to underpin this pair on pullbacks, with no close below it since yesterday. The recent doji right above the prior close highs at 1.0076 looks like the final presence of the bears being pushed out, thus we are favoring an upside break by early Tokyo trading. Upside targets are 1.0110 and 1.0130 while protection below the 20ema. A breakdown here would need to take out 1.0045 which would suggest more unwinding. Global stocks rose solidly as US durable goods and pending home sales surprised to the upside favorably giving a short term positive note to chew on. The Euro continues to be pressured as it appears another country might be asking for a bailout soon ([I]Slovenia - shortly after Cyprus just did[/I]). European leaders are still at a stalemate with Monti threatening if he doesn’t get his Eurobonds (read he needs them to bailout Italy’s €1T of debt) while Frau Merkel continues with the [I]Nein Mantra[/I] also pushing aside calls from Spain for action as well. This trader doubts the Euro Summit will achieve anything meaningful or substantial and when this doesn’t the Euro will be under more pressure. The DOW gained 92pts or .74% while Crude finally rose above the $80 figure. FYI a lot of economic announcements tomorrow so expect some strong volatility. at the moment im getting quite a bit from the watching the candles form the speed at which they go up and down…ill also be interested in if he shows us some stuff about candle formations and positioning of the formations…as i know this too is key. Being a member of your PA course, it’s very nice to see you here. BP is really a great educational site and I’m sure a lot of traders can learn from you. I’m looking forward to reading more about your strategy! I have been studying price action and order flow based strategies and I’m always looking for more ways to round myself out. Your methods definitely fit within my beliefs of what really makes the markets move and building a strategy that is based around that. I’ve been studying forex and demoing for about a year now and just went live, but I’m still trying to learn as much as I can. Welcome to BP!! I’m certainly planning to lurk and see what goes on here, looks to be an interesting start. While going forward I will talk about the trading side of this, can I open the batting with a non-trading question (aimed principally at Chris and Master Tang): what on Earth is a shill?! In all my 38 years I have never heard the word!! Thank you and apologies for the non-trading opening question. This does genuinely look like interesting stuff.